Sometimes you will see vegetarians that eat foods that other vegetarians do not consume which can be confusing. 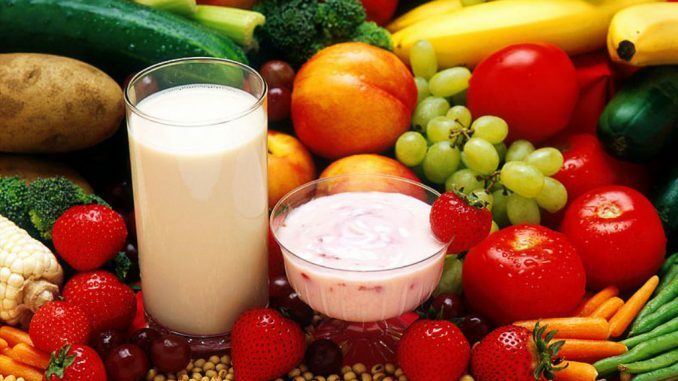 The simple answer is that a vegan diet is one of a number of vegetarian diets. Vegetarian diets are broken into three or more groups. lacto-ovo vegetarians diets include eating dairy products and eggs. This is considered the standard vegetarian diet. lacto vegetarians eat dairy, but avoid eggs. Vegans disassociate themselves from consuming any kind of animal meats: no chicken, beef or fish is on this menu. 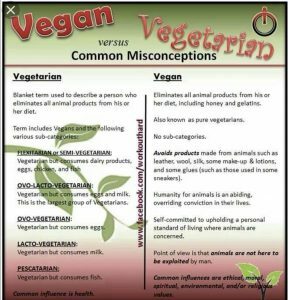 Vegans are also strict in regards to materials or products made from animals such as snake skin shoes or fur clothing derived from foxes, rabbits, minks, or any other furry animal. A friend once told me that he switched to a vegan lifestyle after witnessing animals being slaughtered up close. The thing I never understood is that animals consume other animals as we go from bottom to top on the food chain. A lion preys on boars, buffalo, and other animals which is necessary for it’s survival. I guess vegans would not dare to watch some of the episodes that come on National Geographic or Discovery channels. I personally root for the lions to not starve to death. Vegans view going vegetarian as a stopgap on the path towards veganism. It is thought that most vegans usually go on a vegetarian diet before making the full transition. Studies show vegans and vegetarians are as healthy, if not healthier opposed to their meat-eating counterparts. Veganism, in particular, is very good at eliminating common food allergens that comes from the consumption of shellfish and dairy. A plant-based diet is high in complex carbs from whole grains and root vegetables, such as potatoes and carrots, parsnips, rutabaga, etc. There are also cardiovascular benefits in vegan and vegetarian diets as studies suggest it lowers the risk of cancer. An extensive study published in June 2013 by JAMA Internal Medicine shows that vegetarians live longer than meat eaters and are 19% less likely to die from heart disease. While a vegan diet is healthy, it is necessary to take supplements in order to receive vital nutrients that are lacking from the choices of foods. Top sources of B12 comes from meats such as salmon, liver, milk and other dairy products which are excluded in a strict vegan diet. Other dietary supplements, such as amino acids, iron or vitamin D are necessary as a vegan’s diet tends to lack these essential nutritional components. There is also a risk that a meatless diet does not contain enough protein which will make vegan protein powders a necessity. Thanks a lot, this article is good. I think it’s very important for our health. As someone who has seriously considered and tried to go vegan in the past (not easy to do when your not the one cooking), this article is good to not only highlight all of the health benefits of a plant based vegan diet but to also show the possible risk factors if not managed properly. There are certain nutritional needs a vegan can miss out on without proper supplementation, as you outlined, and it is important for one to know that before adopting this lifestyle. I have considered going vegan also, but supplements may be necessary if you don’t have the knowledge on some food sources it takes for a overall complete healthy vegan diet. I am glad you found this informative in case you take up a vegan diet in the future.